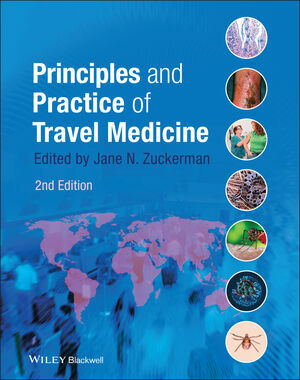 This second edition of Principles and Practice of Travel Medicine has been extensively updated to provide a comprehensive description of travel medicine and is an invaluable reference resource to support the clinical practice of travel medicine. This new edition covers the many recent advances in the field, including the development of new and combined vaccines; malaria prophylaxis; emerging new infections; new hazards resulting from travel to long haul destinations; health tourism; and population movements. The chapter on vaccine-preventable diseases includes new developments in licensed vaccines, as well as continent-based recommendations for their administration. There are chapters on the travel health management of high risk travellers, including the diabetic traveller, the immuno-compromised, those with cardiovascular, renal, neurological, gastrointestinal, malignant and other disorders, psychological and psychiatric illnesses, pregnant women, children and the elderly. With increasing numbers of ever more adventurous travellers, there is discussion of travel medicine within extreme environments, whilst the chapter on space tourism may well be considered the future in travel medicine. Principles and Practice of Travel Medicine is an invaluable resource for health care professionals providing advice and clinical care to the traveller. Having reviewed the first edition in 2001, I welcome the opportunity to review this new one. The format is similar with the content delivered in six sections, but with more chapters in each and information expanded to include new developments and advances in the field. Expert contributors now number an impressive 80, lending a truly international perspective to the content. Travel to international sporting events and a favourite of mine – space tourism – are welcome and timely additions. Although travel abroad for healthcare is not new, the global economic downturn has created a boom in so-called health tourism. The discussion on the reasons, benefits and pitfalls is well covered including the ethical perspective and dilemmas practitioners may face– with case studies to give food for thought. In the preface, the editor asks: “Where have we been, where are we now and where are we going?” - a good indication of what we can expect to find in the book. The majority of people who travel are ‘well’ and the art of practising travel medicine lies mainly in keeping them that way. However, it is becoming more complex for travel health advisers as increasingly those with pre-existing medical conditions are travelling to destinations which may pose a risk to their condition or where the lack of healthcare resources put them at risk if a medical problem arises and they need care. The management of these high risk travellers is covered in Chapter 27 and includes both general and disease specific advice. Good emphasis is given to the fact that there is no age limit for travelling and no one size fits all scenarios. Individuals deserve the best advice for their trip and the list of additional resources for specific reference is most useful. Once again case histories throughout the text helpto illuminate the subjects. Chapter Six looks at the epidemiology and surveillance of travel-related disease and emphasises the benefits of international collaboration in detecting infectious diseases and sharing the information to alert and protect other travellers. Malaria prevention and treatment information is welcome. Chapter 11 (‘The Interconnecting World’) looks at transport, migrants, and emerging and re-emerging infectious diseases, and also considers the role of mobile populations and mass gatherings in this. Numerous excellent tables relating to the importance of travel health support the information. I loved the quote at the beginning, credited to Harvey Cushing: “A physician is obligated toconsider more than a diseased organ, more even than the whole man – he must view the man in his world.” Never was a truer word spoken.